While the Yellowstone Park packs are well know, those in the Greater Yellowstone, outside the Park are known much less, and photos are hard to come by. I was happy to get two photos of the Moccasin Lake Pack from MT Fish, Wildlife and Parks. Jon Trapp took them. This pack roams the foothills and some of the interior of the northern end of Montana’s Absaroka Mountains, south of Big Timber. These photos are the first time the pack has been located since the huge Derby forest fire of late summer. 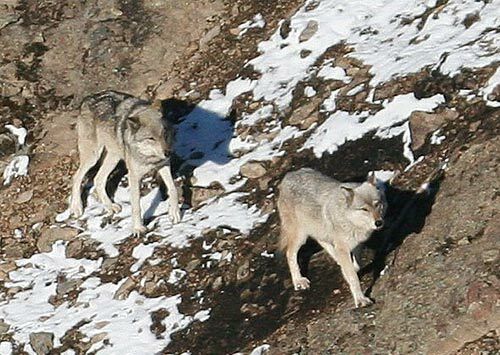 One photo is of the alpha pair crossing a rocky slope. 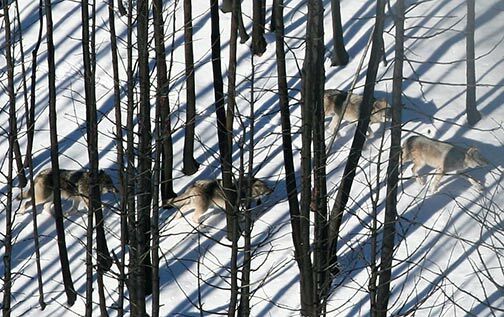 The second is of the pack 2 adults and 2 pups (lower left) crossing through burnt timber. I believe the alpha female is 242F. She is from the old Sheep Mountain Pack that once ruled the country north of Gardiner near Dome Mountain, and the male was originally a disperser from the Park’s Swan Lake Pack, 473M. Last year they were not considered a breeding pair, but hey, this year, 2 pups! Its great to see pics of wolves outside of the park. Thanks for sharing these Ralph.